A Peep Diorama - I kid you not. The amazing folks at National Geographic have managed to float a house using balloons just like the movie, "Up!" Check it out- pretty incredible stuff. Lately, I've had so much to celebrate and be grateful for in my life. This past weekend, I've become even more incredibly lucky. For those of you who enjoy a great surprise proposal, I invite you to check out what I've been up to lately and the latest in my life via the video below! Scientists have done many important things, admittedly, but their latest discovery is one I wish I'd thought of long ago - CHOCOLATE CHIP COOKIE DOUGH DIP! All the great things about cookie dough - the texture, the flavor, the sinfulness - without all the health hazards of cookie dough - i.e. raw eggs and wheat flour (for Gus)! I stumbled upon this recipe while perusing Tastespotting and made my own modifications. Create, enjoy, improve and mangia people! This is some deliciously awesome stuff. - Any additional mix-ins you'd like! 1. Melt butter on medium-low heat in a skillet. Add brown sugar and stir until butter browns and has a nutty aroma (you're creating brown butter). 2. Set butter and brown sugar aside to cool. Combine cream cheese and remaining white and powdered sugar. 3. Add butter/brown sugar mixture to the cream cheese mixture. 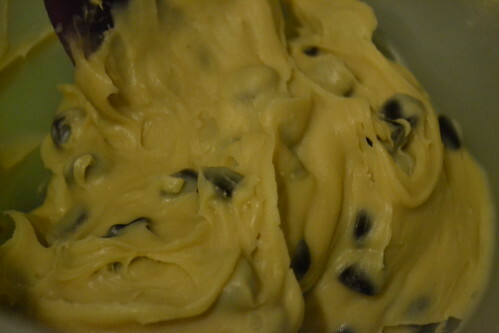 Combine and add chocolate chips/any other mix-ins. 4. 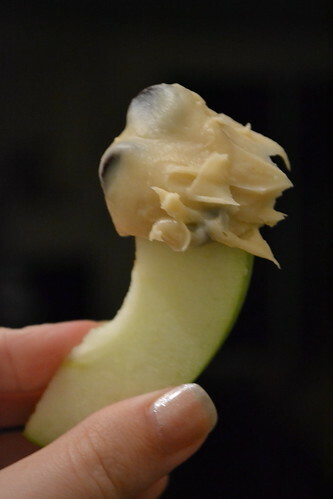 Serve with sliced granny smith apples, graham crackers, or even a bagel! Hey, it's basically Cookie dough cream cheese after all! Nom!